This book was conceived, created, and written by Scott and his third-grade class, with help from their teacher. The text and pictures explains what it’s like to live with lupus. The story is told in Scott’s voice, for children reading the book, and in the voice of Loopy Lupus, for parents, teachers, and caregivers. 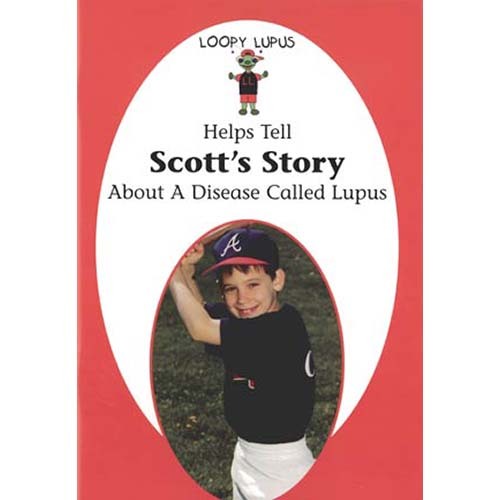 Charmingly illustrated by Scott’s big sister, the book uses the Loopy Lupus bug character to explain the technical side of lupus, while home photos of Scott and his family illustrate Scott’s life with lupus. The book shows how a child can live and even thrive despite the challenges of this difficult disease, as long as he or she has the support of family, school friends, teachers, and school staff members. The hardback version of our popular children’s book is printed in full color on special thick paper and is sure to stand up to many small hands year after year. Consider making a gift of this charming book to the libraries in your community! (2004) 34 Pages.